His early years in Stockton-on-Tees, later living at 145 High Street. ...picture of the Vicarage.. His home in Canada was, of course, Hudson Bay. Not a residence, per se, but an area where he spent time living, exploring, navigating waters, heading to the Bay or heading home to England. His goal: to find the North-West Passage to the Orient. Although he did not succeeded in finding the route, he was successful in his endeavours over a twenty year span ending in 1788. His most important discovery - Baker Lake. 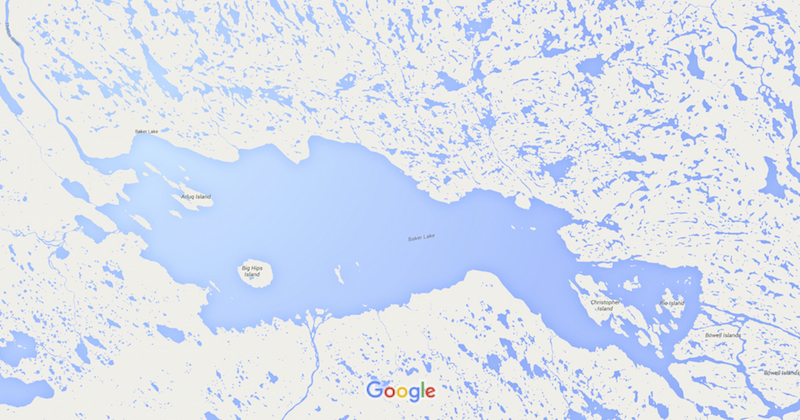 In 1761, he navigated Chesterfield Inlet to the point where it opens up into Baker Lake. He was the first to make it this far inland. He named it Baker in honour of the Governor of the Company at the time. Baker Lake is the geographic centre of Canada. An island formation at the Eastern edge of Baker Lake is named Christopher Island in William's honour. In 1765, William married Ann Tatham of Little Stainton, Durham, England. 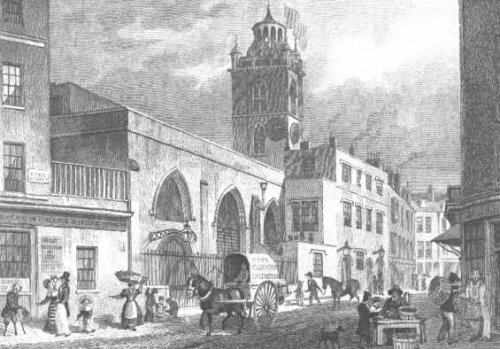 They were married at Saint Giles Cripplegate in London. An interesting event took place in 1782 with William. By that point, he had been travelling to Hudson Bay for a number of years. With the detailed notes that he wrote in his journals and the experience from each journey, he got to know the northern waters very well. This he could use to his advantage on each voyage, but most importantly on this particular trip. England and France were not on the friendliest of terms. The French ship Spectre, captained by La Peyrouse, sailed into Hudson Bay and seized key forts belonging to the English. William Christopher, in command of the Seahorse, came upon the Spectre near Fort Prince of Wales. With the French having as an objective to capture not only the forts but the annual ships, like the Seahorse, with their rich cargo, the chase was on! This is where the knowledge of the waters proved to be the most powerful weapon. As the French tried to gain on the Seahorse, night began to fall. In those times, a chase would actually be suspended until the morning in that it was unsafe to travel at night. William gave order to his crew to furl the sails and to pretend to anchor the ship. The French followed their lead and dropped anchor. The Seahorse's sails were then unfurled and they made off to hide in a bay that Captain Christopher knew would provide them with the much needed cover. They were able, the next day, to continue their voyage to safety and protected the Company's assets. A sly and calculated move that paid off for the seasoned Captain. This is the last Will and Testament of me William Christopher of Stockton upon Tees in the County of Durham, Gentleman. First, I will and direct that all my just Debts, Funeral and Testamentary Expences, and the several Legacies hereinafter by me given and bequeathed, be fully paid and satisfied by my Executors, hereinafter named, out of my Personal Estate as soon as conveniently may be after my Decease. And in case the same shall be insufficient for that purpose, then I subject and charge my Real Estate to and with the raising and payment of the deficiency. I give and bequeath unto each of my Nephews and Nieces, the children of my Brother John Christopher, and Sisters Elizabeth Renton and Jane Wilkinson, who shall be living at the time of my Decease, Twenty Pounds of lawful Money of Great Britain. I give and bequeath unto my said Sister Jane Wilkinson, the Wife of William Wilkinson of Grange Fields in the Parish of Stockton upon Tees aforesaid, Fifty Pounds of lawful Money of Great Britain for her sole, separate and peculiar use and benefit, exclusive and independent of the said William Wilkinson, her husband. And her receipt alone, signed with her own proper hand, to be and which my will and mind is, shall be a sufficient discharge to my Executors for the same. I give and devise all and every my Messuages, Buildings, Lands, Tenements and Hereditaments and Real Estate situate at Grange Fields, Stockton upon Tees, aforesaid, with their and every of their Appurts. and all my Estate and Interest therein unto and to the use of my Friends William Borradaile of Fenchurch Street in the City of London, Merchant James Crowe of Stockton upon Tees aforesaid, Gentleman, and Matthew Crowe of the same place, Gentleman - their Heirs and Assigns. upon the Trusts and for the ends, intents and purposes hereinafter mentioned, expressed, and declared of and concerning the same (that is to say) Upon Trust for Isabella Christopher, my wife, formerly Isabella Lindsey, Spinster, and her Assigns, for and during the term of her natural life in case she shall so long continue my Widow. And from and immediately after the decease or second marriage of my said Wife Isabella Christopher, which shall first happen, upon Trust to convey and assure the same unto and to the use of my Son Henry Christopher, his Heirs and Assigns for ever, at such price or consideration as two indifferent persons - one to be named by them my said Trustees, and the other to be named by my said Son, Henry Christopher, or in case of their disagreement, then as such third person to be nominated by such two arbitrators for their umpire shall value the same at and estimate to be the worth thereof. And in case my said Son, Henry Christopher, shall decline to become the purchaser of my said Estate at Grange Fields, Stockton upon Tees, aforesaid, upon the terms hereinbefore mentioned, Then upon Trust to convey and assure the same unto and to the use of such other of my Sons; George Christopher and Thomas Christopher, his Heirs and Assigns as shall chuse to become the purchasor thereof, at such price or consideration as the same shall have been valued at as aforesaid, it being my will and mind that my said Sons; George Christopher and Thomas Christopher in Rotation according to their Seniority of Age, shall have the first refusal thereof upon the terms aforesaid, and which refusal of my said Son Henry or of my said Sons George and Thomas to become the Purchasor of my Grange Fields Estate upon the terms aforesaid, my will and mind is, shall be made within the space of Eighteen Calendar Months next after the same shall be offered to them, by them my Trustees or Trustee for the time being, and my will and mind is that in case my said Sons; Henry, George and Thomas shall refuse to become the Purchasor of my said hereinbefore devised Estate and Premises at Grange Fields, Stockton upon Tees aforesd. upon the terms aforesaid, Then that they, my said Trustees or the Survivor of them, or the Heirs or Assigns. of such Survivor, shall and do with all convenient speed, after my said Sons; Henry, George and Thomas shall have had during the time aforesaid the refusal thereof, sell, dispose of and convey the same unto any Person or Persons as shall be willing to become the Purchasor for the most money and the best price or prices that can be reasonably had or gotten for the same, and for promoting and facilitating such Sale or Sales, I do hereby express, declare and direct that the receipt and receipts of my said Trustees William Borradaile, James Crowe and Matthew Crowe, or the Survivors or Survivor of them, or the Heirs or Assigns. of such Survivor shall from time to time be a good and sufficient discharge or good and sufficient discharges to the Purchasor or Purchasors of all or any part or parts of the same Estate for so much Money as in such receipt or receipts shall be acknowledged or expressed to be received. And that such Purchasor or Purchasors his, her or their Heirs, Executors Admors. or Assigns. shall not afterwards be answerable or accountable for the loss, misapplication or nonapplication of such purchaserâ€™s money or be in any wise liable to see to the due application thereof or of any part thereof. And my will and mind is, and I do hereby direct that they my said Trustees; William Borradaile, James Crowe and Matthew Crowe and the Survivors and Survivor of them do and shall as soon as conveniently may be after my decease, lay out and invest so much and such part of the Monies arising from my Personal Estate in the purchase of Capital Stock of Five Pounds Per Centum Bank Annuities in their Names, or in the Names or Name of the Survivors or Survivor of them, his Executor or Admors. as will by the Interest and Dividends thereof produce the clear Yearly Sum of Two Hundred Pounds of lawful Money of Great Britain, and stand possessed thereof upon the Trusts and for the intents and purposes hereinafter mentioned and expressed (that is to say) upon Trust that they my said Trustees and the Survivors and Survivor of them, his Executors or Admors. do and shall permit and suffer the said Isabella Christopher, my Wife, and her Assigns. to receive and take the said Interest and Dividends of the said Capital Stock for and during the term of her natural life in case shall so long continue sole and unmarried, and in case she, my said Wife Isabella Christopher, shall remain unmarried until the time of her decease. Then, from and immediately after her decease, In Trust for and for the Benefit of all and every or any one or more of my said Sons; Henry, George and Thomas, and any other my Son or Sons and Daughter or Daughters by the said Isabella Christopher my Wife who may be hereinafter born, who shall be living at the time of her decease, in such parts, shares and proportions and to become a vested Interest and to be transferred at such time or times, and in such manner, and with, under and subject to such provisoes, conditions, and restrictions, and with such limitations over, to, or for the benefit of any of them as my said Wife Isabella Christopher at any time or times during her life and widowhood by any deed or deeds, Instrument or Instruments in Writing, with or without power of revocation, sealed and delivered by her in the presence of and attested by two or more credible witnesses, or by her last Will and Testament in writing, or any writing of appointment in nature of a Will signed by her in the presence of and attested by the like number of witnesses, shall direct or appoint, and in default of such direction or appointment or in case she my said Wife Isabella Christopher shall after my decease Marry again without having theretofore made any such appointment as aforesaid, Then from and immediately after such her death or marriage, my will and mind is and I do direct that my said Trustees and the Survivors or Survivor of them, his Executors or Admors. do and shall transfer the whole of the said Bank Annuities unto and amongst all and every of my said Sons; Henry, George and Thomas and of any other my Son and Sons, and Daughter and Daughters by the said Isabella Christopher my Wife who may be hereafter born, who shall be living at the time of the decease or second marriage of my said Wife Isabella Christopher and the Issue of such of them as shall be then in equal parts, shares and proportions, share and share alike, such Issue nevertheless of any of my said Sons; Henry, George and Thomas or of my said Children by the said Isabella Christopher my Wife hereinafter to be born who shall be then dead standing in the place of his, her or their deceased parent would have had or been entitled to in case he had been living. And my will and mind further is, and I do also hereby direct that they my said Trustees; William Borradaile, James Crowe and Matthew Crowe, and the Survivors or Survivor of them, do and shall as soon as conveniently may be after my decease, lay out and invest so much and such part of the Monies arising from my said Personal Estate in the purchase of Capital Stock of Five Pounds Per Centum Bank Annuities in their Names or in the Names or Name of the Survivors or Survivor of them, his Executors or Admors. as will by the Interest and Dividends thereof produce the clear Yearly Sum of One Hundred and Fifty Pounds of like lawful Money of Great Britain and stand possessed thereof upon the Trusts and for the intents and purposes hereinafter mentioned and expressed (that is to say) Upon Trust that they my said Trustees and the Survivors and Survivor of them, his Executors or Admors. do and shall permit and suffer my Son John Thomas Christopher and his Assigns. to receive and take the said Interest and Dividends of the said Capital Stock for and during the term of his natural life. Then from and immediately after his decease, Upon Trust for and for the benefit of all and every that Child and Children of the Body of my said Son John Thomas Christopher, lawfully to be begotten who shall be then living or born in due time after the decease of my said Son John Thomas Christopher and of myself, in equal parts, shares and proportions, share and share alike (if more than one) and if there shall be but one such Child, Then In Trust for and for the absolute use and benefit of such one Child to be a vested Interest in and transferable to such Child or Children respectively at the times and in the manner following (that is to say) The Portion, part or share, parts or shares of such of them as shall be a Daughter or Daughters to be a vested Interest in and transferable to her or them at her or their age or respective Ages of Twenty One years or day or respective days of Marriage which shall first happen, and the portion, part or share, parts or shares of such of them as shall be a Son or Sons to be a vested Interest in and transferable to him or them at his or their age or respective ages of Twenty One Years, and that if any one such Child being a Daughter shall depart this life under the age of Twenty One Years not having been married, or being a Son shall depart this life under the age of Twenty One Years then the part or share of such Child so dying shall go and accrue and be disposed of to or for the benefit of the other Child or Children in such and the like manner to all intents and purposes as if such Child so dying had never existed and if any other or others of the said Children being a Daughter or Daughters shall depart this life under the age of Twenty One Years not having been married, or being a Son or Sons shall depart this life under the Age of Twenty One Years, Then the part or share, parts or shares as well original as accruing of such other Child or Children so dying shall from time to time go and accrue and be disposed of to or for the benefit of the other Child or Children in such and the like manner to all intents and purposes as if such Child or Children so dying had never existed. And upon this further Trust that they, my said Trustees and the Survivors and Survivor of them, his Executors or Admors. shall and do pay and so apply all the dividends and Interest of the said Capital Stock of Bank Five Pounds Per Centum Annuities so to be purchased as last aforesaid or as much and such parts thereof as they or he shall in their or his discretion think necessary for or towards the Maintenance and Education or other use for the benefit and advantage of such Child or Children, until their respective shares of the Principal shall become transferable to them, and in proportion to their respective shares and Interests therein. And in case all and every the said Child and Children of the Body of my said Son John Thomas Christopher shall afterwards depart this life before any of them shall have acquired a vested and transmissable Interest in the said Bank Annuities last mentioned. Then Upon Trust that they my said Trustees and the Survivors or Survivor of them, his Executors or Admors. do and shall transfer the whole of the said Bank Annuities unto and amongst all and every of my Sons; Henry, George and Thomas and of my Children hereafter to be born who shall be then living and the Issue of such of them as shall be then dead, in equal parts, shares and proportions, share and share alike, such Issue nevertheless of any of my said Sons; Henry, George and Thomas and of my Children hereafter to be born who shall be then dead standing in the place of and taking only the share or proportion which his, her or their deceased Parents would have had or been entitled to in case he or she had been living, and to and for no other Trust and intent or purpose whatsoever. And my will and mind further is, and I do also hereby direct that they my said Trustees, William Borradaile, James Crowe and Matthew Crowe and the Survivors and Survivor of them, and the Executors or Admors. of such Survivor do and shall as soon as conveniently may be after my decease, lay out and invest so much and such part of the Monies arising from my said Personal Estate in the Purchase of Capital Stock of Five Pounds Per Centum Bank Annuities in their Names or in the Names or Name of the Survivors or Survivor of them, his Executors or Admors. as will by the Interest and Dividends thereof produce the clear yearly sum of One Hundred Pounds of like lawful Money of Great Britain and stand possessed thereof upon the Trusts and for the intents and purposes hereinafter mentioned and expressed (that is to say) Upon Trust that they my said Trustees and the Survivors and Survivor of them, his Executor or Administrators, do and shall during the natural life of daughter Caroline Christopher receive the dividends and Interest of the said last mentioned Bank Annuities from time to time when and as the same shall become due and payable and do and shall pay, apply and dispose thereof for the Maintenance and Education of my said daughter Caroline Christopher in such way and manner as my Wife, Isabella Christopher shall direct so long as she shall remain my Widow, and afterwards at the discretion of my said Trustees, until she shall attain the age of Twenty One Years or be married with the consent and approbation in writing of my said Wife and of the said William Borradaile, James Crowe and Matthew Crowe and the Survivors and Survivor of them, which I do hereby expressly will and direct shall be obtained by her previous to such Marriage, and when and so soon as she shall have attained her said age of Twenty One Years or shall be Married with such consent as aforesaid, upon further Trust that they my said Trustees and the Survivors and Survivor of them, and the Executors or Admors of such Survivor do and shall pay, apply and dispose of the said dividends and Interest of the said last mentioned Bank Annuities unto such Person or Persons only and to and for such intents and purposes only as my said daughter Caroline Christopher shall, whether sell or convert, and during and notwithstanding any coverture by any Note or Writing to be Signed by her from time to time, direct or appoint, and in default of such direction or appointment and in the mean time, and from time to time until my said daughter shall make any such direction or appointment, or in case of any such direction or appointment which shall not extend to the whole of the said dividends and Interest of the said Bank Annuities so to be purchased as last aforesaid, do and shall pay, apply and dispose of the whole of the said dividend and Interest, or so much thereof whereof my said daughter shall make no such direction or appointment as last is mentioned into the proper hands of my said Daughter during her life for her sole, separate, personal and peculiar use and benefit. And I do hereby expressly will and direct that the same shall not be subject to the intermeddling, control, debts or engagements of any husband or husbands with whom she may Intermarry, but that her receipt alone shall from time to time notwithstanding any coverture be sufficient discharge to my said Trustees or Trustee for the time being for the same, and from and immediately after the decease In Trust that they my said Trustees or the Survivors or Survivor of them, or the Executors or Admors. of such Survivor shall and do transfer the whole of the said Capital Stock so to be purchased as last mentioned unto and amongst all and every the Child and Children of the Body of my said daughter lawfully to be begotten, equally to be divided between or amongst them (if more than one) share and share alike and if there shall be but one such Child then to one such Child to be vested and transmissable Interest and vested and transmissable Interests in them respectively at such and the like times and in such and the like manner (except in the event of the same happening in the life time of my said Daughter Caroline Christopher, in which case the same although vested shall not be transmissable until after her decease) and with such and the like benefit of Survivorship to and amongst them in her life before having acquired a vested Interest and vested Interests and with such and the like Maintenance for their benefit out of the dividends and Interest of their respective shares of the Capital (but the same only to take place from the decease of my said daughter Caroline Christopher) in the mean time and until their respective shares shall become transferrable as hereinbefore are by me directed and declared with respect to the Children of my said Son John Thomas Christopher for and in respect of the aforesaid Capital Stock of Five Pounds Per Centum Bank Annuities to be purchased for their benefit as aforesaid and that as fully and effectually as if the same were herein repeated. And in case there shall not be any Child of the Body of my said Daughter begotten, or there being such Child or Children if all and every such Daughter and Daughters shall depart this life under the age of Twenty One Years not having been Married and all and every such Son and Sons shall also depart this life under the age of Twenty One Years, Then Upon Trust that they my said Trustees and the Survivors or Survivor of them, his Executors or Admors do and shall transfer the whole of the said Bank Annuities last mentioned unto and amongst all and every of my Sons; Henry, George and Thomas and of my said Children hereafter to be born, who shall be then living and the Issue of such of them as shall be then dead, in equal parts, shares and proportions, share and share alike, such Issue nevertheless of any of my said Sons; Henry, George and Thomas and of my said Children hereafter to be born who shall be then dead standing in place of and taking only the share or proportion which his, her or their deceased parents would have had or been entitled to in case he or she had been living, and to and for no other Trust, end, intent or purpose whatsoever. And I give and bequeath the use and enjoyment of all my Household Goods, Furniture and Implements of Household Plate, Linen, China and Books, unto my said Wife Isabella Christopher for and during the term of her natural life in case she shall so long continue my Widow, and from and immediately after her decease or Marriage after my decease I give and bequeath the same unto and equally between all and every my said Sons; Henry, George and Thomas, and my said Children by the said Isabella Christopher my Wife born, or who shall be hereafter born who shall be then living absolutely. And I give and bequeath all my Guns, Pistols and Swords unto and amongst all my Sons now born, and my Children by my said Wife Isabella Christopher who may be hereafter born, agreeable to their Age in such manner and at such times as my Executors and Executrix shall think proper. And I give and bequeath my Carriage and Horses with their Harness and Appurtenances unto my said Wife Isabella Christopher in case and provided she keeps them for her own use, but otherwise I direct that the same be Sold by my Executors and Trustees for the best price and most Money they can get for the same, and the Net Monies arising by the sale thereof paid to the said Isabella Christopher my Wife for her own use and benefit. And all the Rest, Residue and Remainder of my Goods, Chattels, Stocks, Funds, Monies, Mortgages and Securities for Money, and all other my Real and Personal Estate and Effects whatsoever and wheresoever and of what nature, kind or quality soever the same be not by me otherwise already disposed of, I give and bequeath the same and every part thereof and all my Estate and Interest therein unto the said William Borradaile, James Crowe and Matthew Crowe and my said Wife Isabella Christopher their Heirs, Executors, Admors. and Assigns. upon the Trusts and for the ends, intents and purposes hereinafter mentioned, expressed and declared of and concerning the same (that is to say) Upon Trust that they the said William Borradaile, James Crowe and Matthew Crowe and my said Wife Isabella Christopher, and the Survivors or Survivor of them, and the Executors or Administrators of such Survivors do and shall in the first place make sale and dispose of and convert into Money such part thereof as shall not consist of Monies or Securities for Money, and do and shall collect out, in and receive such part thereof as consists of Monies or Securities for Money, and do and shall in the next place take an account of all and every principal Sum and Sums of Money which have been heretofore advanced or which shall or may be hereafter advanced by me for the use or benefit of my said Sons; Henry, George and Thomas in or towards their advancement in life or for the use or benefit of my other children by the said Isabella Christopher my Wife, who may be hereafter born, for the like purpose, and which will appear by my Books and which I require my said last mentioned Sons and other Children respectively to give to give a just and fair account of to my Executors in case my Books shall have been destroyed or the same shall not appear clear, thereby in order that the same Sums of Money and debts may be brought into Hotchpot with the produce of the Residue of my Estate and Effects (exclusive of the Monies at which my said hereinbefore Devised Estate and Premises at Grange Fields, Stockton, shall have been Sold for to any of my said Sons; Henry, George and Thomas, upon the terms aforesaid or to any other Person or Persons whomsoever under and by virtue of this my will) in order and to the intent that each of my said last mentioned Sons and any other my Son or Sons and Daughter or Daughters by the said Isabella Christopher my Wife who may be hereafter born, may have an equal share and participation of my last mentioned Estates and Effects, or the produce thereof as aforesaid, without any preference or priority whatsoever, and from and after the amount thereof shall be ascertained, do and shall pay and divide the same equally to and amongst all and every my said Sons; Henry, George and Thomas, and any other my Son or Sons, and Daughter or Daughters by my said Wife Isabella Christopher who may be hereafter born who shall be then living, share and share alike. And my will and mind is that in case any of my said Sons; Henry, George and Thomas or any of my after born Sons and Daughters by the said Isabella Christopher my Wife, shall be under the age of Twenty One Years at the time of my decease as aforesaid, they my said Trustees and Executors and the Survivors or Survivor of them do and shall place out and invest the share or shares last mentioned of such of them my said Sons or Daughters as shall be under such age at the time of my decease, in the Public Stocks or Funds or on Government or Real Securities at Interest in their, his or her Names or Name, and alter, vary and transport the same as they shall see proper and think most for the Interest of my said Sons and Daughters respectively, and pay, apply and dispose of all or such part of the Dividends and Interest of the share, or respective shares of such of my said last mentioned Sons and Daughters accordingly in and for their Maintenance and Education or otherwise for their Advancement or benefit, and also apply any part of the Stocks, Funds or Securities themselves in and for their advancement or placing out in the World, until they shall attain their full age of Twenty One Years, as they shall think most proper and adviseable. And upon my said last mentioned Sons and Daughters respectively attaining such Age, do and shall assign or transfer the Stocks, Funds or Securities belonging to each of my said last mentioned Sons and Daughters or so much and such part thereof as shall not have been appropriated and all accumulations (if any) of Interest of the Funds or Securities on which the same may be placed unto my said last mentioned Sons and Daughters absolutely for their own respective use and benefit. And my will and mind is that in case any of my said Sons; Henry, George and Thomas, or of my after born Sons and Daughters by my said Wife Isabella Christopher who shall be under the age of Twenty One Years at the time of my decease shall depart this life before attaining such Age without having lawful Issue of his, her or their Body or Bodies, that the share of shares of him, her or them respectively so dying under such Age without lawful Issue as aforesaid of and in the Residue of my said Estate and the Funds or Securities whereon the same respectively shall or may be placed out or invested or such part thereof (if any) as shall not have been applied for their, his or her advancement in the World shall survive, and go to and be equally divided between the Survivors of all my said Sons; Henry, George and Thomas and of my after born Sons and Daughters by my said Wife Isabella Christopher, and the Issue of such of them as shall be then dead, such Issue standing in the place only and taking the share which his, her or their deceased parent would have had or been entitled to in case he had been living to be paid applied and disposed of in the like manner as their own original shares. And in order that my will and intentions as to the disposal of my Estate and Property as hereinbefore expressed may be fully performed, I hereby declare that in case any Person or Persons whomsoever to or in favour of whom any Legacy or Bequest whatsoever is hereinbefore by me made or given, shall in any case controvert or dispute any other of the Legacies or Bequests hereinbefore by me made or given to any other or others of them, or by commencing any Action or Suit at Law or Equity, or in the Commons endeavour to set aside, annul, or vacate this my last Will or any of the devises or bequests herein contained, that such Person or Persons so acting shall immediately thereupon forfeit the Legacy or Bequest herein and hereby meant or intended to be given or provided to, or for him, her or them, and the Legacy or Legacies, Bequest or Bequests so forfeited shall from thenceforth go and be divisible to and amongst such Persons as would have been entitled to the Residue of my Estate and Effects under this my will, in case such Legacy or Bequest, Legacies or Bequests had been omitted therein any thing in this my will contained to the contrary thereof notwithstanding and for the better effectuating of the purposes of this my will I give and devise all such Messuages, Lands, Tenements, Heredits. and Real Estate as are now vested in me by way of Mortgage unto and to the use of my said Trustees William Borradaile, James Crowe and Matthew Crowe and my said Wife Isabella Christopher, their Heirs and Assigns. the better to enable them my said Trustees and the Survivors and Survivor of them and the Executors and Admors. of such Survivor to recover out in and receive and control payments of the Principal and Interest Monies due thereon. And I do hereby nominate, constitute and appoint the said William Borradaile, James Crowe and Matthew Crowe and my said Wife Isabella Christopher Executors and Executrix of this my Will and I give to each of them the said William Borradaile, James Crowe and Matthew Crowe the Legacy or Sum of Fifty Pounds of lawful Money of Great Britain, and my further will is that they my said Trustees and Executors and Executrix or any of them, their or any of their Executors or Admors. shall not be charged or chargeable with or accountable for any more of the aforesaid Trust, Estate, Monies and Premises than they respectively shall actually receive or shall come to their respective Hands by virtue of this my Will, nor with or for any loss which shall happen of the same Estate Monies and Premises or any part thereof so as such loss happen without their wilful default, nor any one of them for the other or others of them, or for the Acts, Deeds, Receipts or Disbursements of the other of them but each of them only for his and her own Acts, Deeds, Receipts or Disbursements. And also that it shall and may be lawful for them my said Trustees and Executors and each and every of them, their and each of their Executors and Admors. in the first place by and out of the aforesaid respective Trust Estate Monies and Premises to deduct and reimburse him and themselves respectively all such loss, costs, charges and expences as they or any of them shall respectively sustain, expend or be put unto for or by reason of the said several Trusts hereby in them reposed in relation to the same Estates, Monies and Premises respectively or the Management and Execution thereof, or any other thing in any wise relating thereunto. Signed, sealed, published and declared by the said Testator William Christopher as and for his last Will and Testament in the presence of us who at his request in his presence and in the presence of each other have subscribed our Names as Witnesses thereto, the several words "Then the part or share, parts or shares" in the thirty second line of the Fourth Sheet being first Obliterated and the several erasures upon which the word "transferrable" on the fourth line of the Fifth Sheet and the word "attained" on the thirty seventh line of the same sheet being first made Joseph Tidd, Temple @ St. Chads Row, Grays In Road. Chas. Lucas Clerk to Mr Edwards of the Temple. Thos. Barnwell No. 64 Fleet Market. This Will was proved at London the Sixth day of December in the Year of our Lord one thousand seven hundred and ninety seven before the Right Honourable Sir William Wynne, Knight, Doctor of Laws, Master Keeper or Commissary of the Prerogative Court of Canterbury lawfully constituted by the Oaths of William Borradaile, James Crowe, Matthew Crowe and Isabella Christopher Widow, the Relict of the deceased and the Executors named in the said Will by whom Administration was granted of all and singular the Goods, Chattells and Credits of the said deceased, they having been first sworn, that is to say the said William Borradaile before the worshipful Samuel Pearce, Parson, Doctor of Laws and Surrogate and the said James Crowe, Matthew Crowe and Isabella Christopher Widow, the Relict of the deceased, by Commission duly to Administer.